The company also specializes in local, national and international towing and recovery of motorcycles, cars, vans, trucks, buses and coaches. Therefore we have different types of towing and recovery vehicles that are all specially designed and made for small to large recovery. For local roadside assistance, we have a mobile workshop equiped with all the necessary tools to carry out many repairs on site and with special lighting to alert the other road users that a vehicle is stationary with problems down the road. Safety in the first place. We are recognized and we are working for police, garages, private persons, many insurances and assistances organizations. 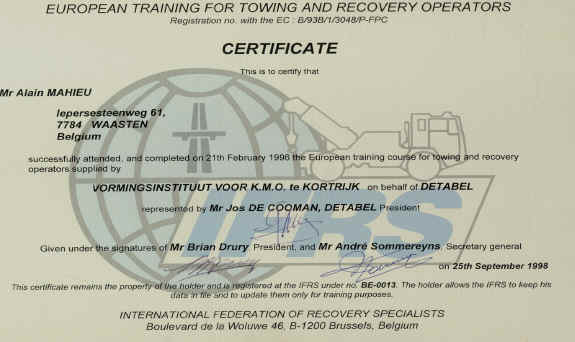 "EUROPEAN TRAINING FOR TOWING AND RECOVERY OPERATORS"
Our equipment is annually subjected to rigorous inspections. And this combined with common sense and knowledge of the hoist master. We are proud of our 1998 European certificate.